"What America ultimately needs is spiritual change—a transformation that starts in individual hearts." -Franklin Graham. 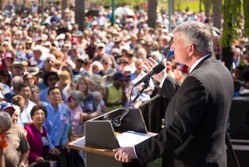 Franklin Graham says God has put a calling on his heart. The evangelist is following the Lord's lead as he prepares to hold more events focused on prayer and evangelism in the U.S. this year, following last year's successful 50-state Decision America Tour. Starting on Monday, May 15, Franklin Graham will kick off the Decision America Tennessee Tour in Chattanooga. From there, he'll take the Gospel across the Volunteer State to Clarksville and Jackson, with a final stop in Memphis. Chattanooga, Tennessee: May 15, 7:30 p.m.
Clarksville, Tennessee: May 18, 7:30 p.m.
Jackson, Tennessee: May 19, 7:30 p.m.
Memphis, Tennessee: May 21, 7:30 p.m. In 2016, Franklin Graham traveled to all 50 state capitals, encouraging people to pray, vote and engage in the political process. As he shared the Good News of Jesus Christ at each prayer rally, Franklin said he sensed God calling him to reach even more people throughout the United States. "God has given me a burden to go back, this time to preach in medium and smaller cities across states and regions," he said. Lawrence Swicegood, director of the Decision America Tennessee Tour, emphasized the importance of BGEA's partnership with the local church for these one-night events. "Thousands of churches and tens of thousands of people are excited to come together this May to pray for their communities in the Volunteer State," Swicegood said. Each event will also feature a time of praise and worship, and for many Tennesseans, music is an integral part of life. Dove Award-winning band The Afters will kick off the tour in Chattanooga, and Dove Award-winning singer/songwriter Jeremy Camp will join the tour in Clarksville, Jackson and Memphis. Each stop will also include worship music from fast-picking guitarist and singer Dennis Agajanian, who has traveled the world sharing the Gospel at Crusade events alongside Billy Graham and Franklin Graham. At each event, Franklin Graham will lead people in praying for America, their state and local community—just as he did with the more than 230,000 people who joined him at a tour stop last year, with another 150,000 views online. More importantly, over 8,000 people indicated they made a decision for Christ. Helping people come out of despair and hopelessness and find life-changing hope in Christ is why Franklin will visit many small towns in America—where larger events may not typically come. "What America ultimately needs is spiritual change—a transformation that starts in individual hearts," Franklin Graham said recently. This fall, he'll take the tour to the Lone Star State—giving Texans Good News as the Decision America Texas Tour stops in seven cities. And, God-willing, Franklin says, he hopes to return to many more states over the next several years. It's his hope that each region of the U.S.A. will be saturated "with the hope of the Gospel and a call to prayer and repentance."